The Pilates Method of Body Conditioning is a system of exercises that focus on the “Powerhouse.” These deep postural muscles of the body—mainly the abdominals, buttocks, hips and inner thighs—strengthen and lengthen the body. While strengthening the core stability muscles, Pilates works towards re-aligning the spine to its optimum position. Focusing on this proper form and alignment while strengthening the core stability muscles through movement is what Pilates is all about. You must connect your mind to your body in order to execute the movement properly. The Pilates Method of Body Conditioning is, in many respects, very different from your typical gym workout. 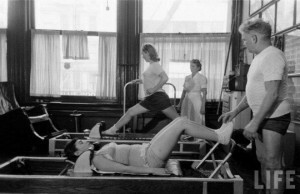 The exercise program utilizes a system of over 500 exercises using specialized equipment created by Joseph Pilates. Pilates is based on six key principles consisting of centering, control, concentration, breath, flow, and precision. The goal within each exercise is to achieve each of those principles. As the body gains strength through practice and repetition, you learn to focus mentally and execute moves no matter how difficult. 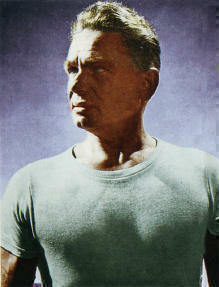 Joseph H. Pilates (“puh-LAH-teez”) was born in Monchengladbach, Germany December 9, 1883. As a child he dealt with chronic illnesses such as rickets, severe asthma, and rheumatic fever, which lead him to study physical fitness and health. He started studying human anatomy and the movement of animals at a young age. In addition, he also studied many different Eastern forms of exercise, such as yoga and Tai Chi. He was a skier, diver, gymnast, and boxer, who studied yoga and circus training. He found work in England with his brother as a circus performer; they had a Greek statue act. In the first part World War I, where he was placed in an internment camp with injured soldiers, he began developing an exercise system that he later named “Contrology.” He balanced his system based on Western and Eastern philosophies of exercise. He taught his exercise system to fellow internees. 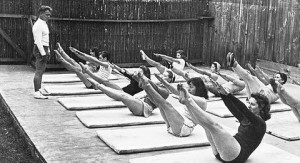 When an outbreak of influenza swept through the camps, people who trained with Pilates were not infected with the influenza. During the later part of the war, he served as an orderly in a hospital where he developed his unique equipment to help rehabilitate wounded soldiers. He attached springs to the back of patients’ hospital beds to help rehabilitate their arms and legs. While traveling to The United States, he met Clara who never legally married although they lived as Mr. & Mrs. Pilates. She would have been his third wife. In 1926 they introduced his method to New York and opened up a studio on Eighth Avenue. He originally worked with mostly men, especially boxers. Their studio was in the same building as many dance studios and rehearsal spaces. In the late 1930’s George Balanchine and Martha Graham both sent their dancers to “Uncle Joe,” and ever since then, Pilates has gained popularity within the dance community. Joe and Clara also spent many summers at Jacob’s Pillow, a very well know summer dance camp in the Berkshire Mountains. Joseph H. Pilates passed away October 7, 1967 at the age of eighty-three. His wife Clara continued to teach and maintain the studio for 10 more years until her passing in 1977.